OPINION — Last column I promised to offer my suggestions for reducing gun crime in America, and I will, but there’s a problem with that. The issues we face can’t be dealt with in 800 words. When I started trying to decide in what order to address the areas that need fixing, I realized there are way too many problems to address in one column. You could write a book about the issues in the country, and many have. So my solutions will have to be condensed, and will still take more than one article. First of all, gun crime is related to guns only tangentially. If guns actually killed people, then the bloodiest, most dangerous places in the country would be gun stores, gun shows, shooting ranges, police departments, and military armories. Those places have more guns than anywhere else, yet fewer crimes occur there than anywhere else. Secondary places to avoid would be states and/or counties with the most lax gun laws, where more citizens per capita are armed on a daily basis. In fact, those places see less crime, and fewer homicides, than the places where gun ownership is most difficult and highly controlled by the Gubmint. The facts prove that gun ownership is not the cause of crime, even gun crime. Most gun crime is, in fact, committed using guns that are not legally owned, so legal gun ownership is not the problem. If guns caused gun crime, it would be logical to assume that people who have concealed carry permits, and carry guns around all the time, leave a trail of victims wherever they go. Actually, concealed carry permit holders are, statistically, the least likely of all citizens to commit crimes of all types, including gun crimes. According to the Crime Prevention Research Center, police officers in Texas and Florida commit seven times as many misdemeanors and felonies as concealed carry holders in those states. Citizens without permits to carry commit 37 times as many crimes as police officers. So guns are obviously not the problem, since the people who have the most guns are committing the fewest crimes, and by far the fewest homicides. Some claim the solution is to ban all guns, or certain guns, but gun bans only work on people who obey the laws. Criminals don’t obey the laws. If we really want to save lives, we have to do better than trying to take tools away from people. There are two approaches necessary to reduction of gun crime in America. One is short term, and the other is long term. We can’t ignore either, and Gubmint only plays a major part in the short term solution. If we depend on Gubmint, and only address short term issues, the big picture will never go away. And if we only take a long term approach, it will be years before we see results. Gun crime is a symptom of a much larger disease, and the necessary short term changes address only the symptom of gun crime. According to Medical News Today, the leading cause of death in America is heart disease (gun deaths are not on the list, except obliquely, in regard to #10, suicides). But heart disease is not only a physical problem. It’s also the reason we have to have a long term approach to gun crime. All the evil committed by humans comes from the heart (meaning the mind). We’ll address those issues later, but we’ll start with the short term changes that need to be made. Obviously, it doesn’t. Schools need armed guards, preferably people who don’t appear to be guards. The guards need to be well-trained, not just vetted and approved. Ex-combat veterans could fill that need perfectly, and plenty of them need jobs. Teachers, if they are willing to complete extensive training (MORE training than most police officers receive) could also be used, in some situations. The one thing I can guarantee is that deranged people will keep shooting up schools. The only way to stop it is with superior force. A sign is just an invitation to commit carnage. 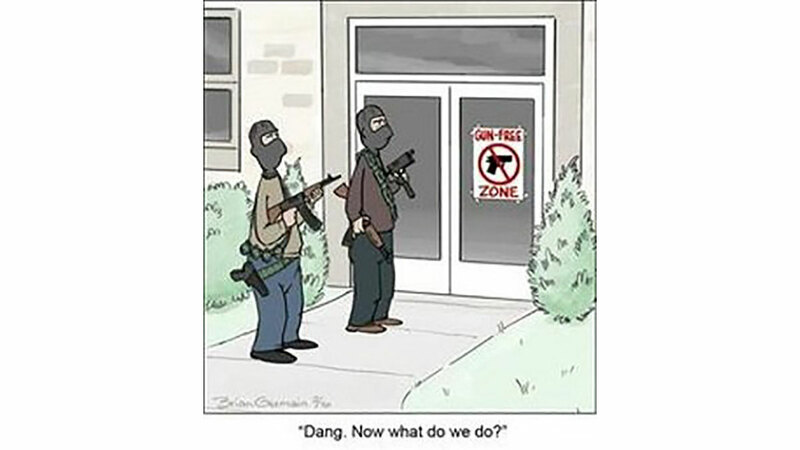 Gun free zones should be abolished, with few exceptions. Sporting events, polling places, airport terminals, and bars are probably not good venues for excited people to carry guns, but those places should definitely be protected by armed police officers, because signs don’t work. There is no reason to ban guns from federal buildings, post offices, hospitals, restaurants, universities, or churches. The NICS database is another area that needs improvement. The system is only as good as the information fed into it, so if criminal and mental health records aren’t updated constantly, it doesn’t work. Prohibited persons must always be prosecuted when they try to buy guns, which doesn’t happen at present. So, short term, we should use common sense, and protect our schools with well-trained, plain-clothed armed guards, and allow people to carry guns almost everywhere else, if they haven’t forfeited their constitutional rights through their actions.. Not everyone will agree with this plan, but that doesn’t negate the fact that it would lower the homicide rate drastically. Next, we’ll look at the long-term plan, which is far more complex, but no less necessary. If you didn’t like this week’s column, you’ll hate next week’s . . . Your first premise is such a typically sophomoric statement the rest of your column isn't worth a glance. Let’s just send all our children to schools in tactical uniforms. Or better yet, put all the schools in police stations or on military bases. Problem solved. That way we can pretend to address the issue without actually addressing the issue. Look at all the statistics you want and you can see that what Kendal write's is true, in the places that have higher numbers of legal gun ownership with less restrictive gun laws also have "less" gun violence... Just look at the differences between Texas and Chicago... Now, we can argue a lot about the differences between the two but one thing that still rings true is that we see less gun crime in Texas because criminals here know that they are taking a major risk to rob someone in their home or vehicle here and we have the less restrictive law, as a result, higher numbers of legal gun owners. 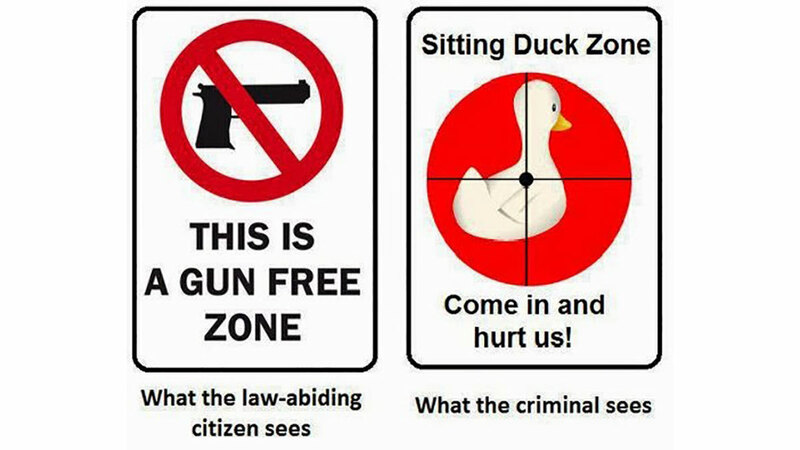 Gun free zone's are a joke, they only serve to keep law abiding gun owners from packing in those zones, the criminal doesn't care about a bigger penalty for bringing a gun here... It really does appeal to someone who wishes to take life because nobody in that zone can stop them easily. Even more disturbing to me, is the idea that we trust schools to keep our kids safe with the kind of things we're seeing. I do believe that they could be much safer if we changed some things... Gubmint ideas about keeping kids safe in school fall drastically short of my personal standards and I don't see much going on at the federal level to change things that matter... Deflection and misinformation about the topic can be seen throughout recent history and it stands to reason that the people who spread the most misinformation about guns are the one's who have never used them. I have to agree with some Kendal, some of the simple changes that we could make would make the most difference. Violent gun incidents will always be a problem in some form or fashion but we don't have to make it easy... Let's make laws to empower the people, not restrict them. Criminals should be afraid of the immediate consequences of their actions, if we had armed veterans and teachers at school we wouldn't need much else to deter mass school shootings. Look at your average voter who has no idea what they're voting against in reality... Gun's scare a lot of folks, after all the Hollywood portrayals of gun violence in movies who could expect anything but ignorance from those who've never used them. It isn't neutral about origins, it isn't neutral about history and it isn't neutral about ethics.